The history of endless US savagery reads like a horror story. Of course there was Hiroshima and Nagasaki. Just a little preview of things to come when a monster gets its hands on weapons of mass destruction. When they first started feeling their oats after the Warsaw Pact was disbanded, there was the savage, murderous attack on Yugoslavia for a pack of lies. 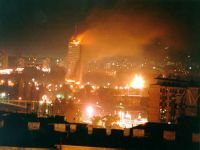 Damage done to Yugoslavia was estimated to be USD 30 billion. In the 78 days of the attacks, 540 buildings were destroyed, 58 bridges and 30,000 homes. There were 146 air raid alarms which combined lasted for 774 hours, for an average of 9 hours and 55 minutes a day. The insatiable lunatics were flying over 650 sorties every night. Talk about savagery and overkill, lack of civilization and absolute terrorism, not to mention the war crime of collective punishment of Yugoslav civilians who were expected to rise up against their leadership because they had been sufficiently terrorized. Is this the way a respectable nation behaves, a nation who expects everyone else on the face of the Earth to be a carbon copy of themselves? "If President Milošević really wants all of his population to have water and electricity all he has to do is accept NATO's five conditions and we will stop this campaign." Right, just like that, roll over, bend the knee and allow NATO to do whatever it wants. Then there was Iraq. A completely devastated infrastructure, over a million dead and people still dying and suffering...much of the environment plagued with nuclear contamination, NATO totally wrecked the place. Again, all because of lies. Then Afghanistan, now being forced to reveal and surrender its great resources, not to mention the lucrative drug trade, the heroin and opium, now being mass produced thanks to NATO. What Part of "Bans the use or threat of force" does the US and Israel not understand? This is part and parcel of the UN Charter. Specifically, in UN Resolution 1887 of September 2009, the Security Council reaffirmed the call for all states to resolve nuclear issues peacefully in accordance with the Charter, which bans the use or threat of force. Iran's military doctrine is strictly defensive ... designed to prevent any invasion force from occupying the country. Iran is also committed to diplomatic solutions to hostilities or disputes. Iran only has "limited ability" to project force beyond its borders. Studies done make clear that the Iranian "threat" is not military. Iranian military spending is low compared with others in the region, and less than 2% of that of the U.S. US efforts to slander and lie about Iran's peaceful nuclear program range from the outright fabrication of documents recently discovered in at least two instances, to trying to silence the IAEA and Director General, Mohamed El Baradei, who just cannot be convinced to lie for them. Anyone remember the fabricated document purporting to show an Iraqi effort to buy uranium in Niger, which was used by George Bush as part of his propaganda efforts in the buildup to the Iraq invasion of 2003? It's happening again and there is no excuse for people to be unmindful and especially silent that it's happening again. Why is it constantly ignored in the western corporate media and by all the lying political buffoons that Ayatollah Ali Khamenei issued a fatwa forbidding the production, stockpiling and use of nuclear weapons on August 9, 2005. The full text of the fatwa was released in an official statement at the meeting of the International Atomic Energy Agency (IAEA) in Vienna. That ostensibly should settle the matter once and for all. What part of "it is forbidden" do they not understand? Now regarding the threats against Iran, what are Israeli warships doing, for the first time, in the Persian Gulf, the Strait of Hormuz and Iran’s maritime areas? They are accompanied by a US fleet whose declared mission is "to implement sanctions against Iran and oversee the ships arriving or departing Iran." British and Israeli media reported that Saudi Arabia is providing a corridor for the Israeli bombing of Iran (Saudi Arabia denies this, another lie). Military equipment being prepared for the aggression against Iran includes 387 "bunker busters" [bunker buster bombs] used to attack fortified subterranean structures. Preparations for these "massive attacks" with bunker busters, the most powerful bombs in the small arsenal of nuclear weapons began in the Bush administration. Upon taking office, Obama immediately accelerated the plans in order to target Iran. "They are in high gear for the destruction of Iran," said Dan Plesch, director of the Center for International Studies and Diplomacy at the University of London. "Bomber and long-range missiles are ready today to destroy 10,000 targets in Iran in a few hours," he said. Again, Operation Overkill; Operation Terrorize the People; Operation Destroy a Country; Operation Contaminate the Landand Kill and Deform Generations to Come. They are planning nothing as they state, it's not going to be a mere "surgical strike." The US and Israel love to whine and play the terrorism victim card, but they themselves are the worst terrorists this world has ever seen. Current activities of the Empire have led revolutionary leader, Fidel Castro, to gloomily predict that nuclear war will soon be upon the world. It is a resignation that cannot be taken lightly, knowing the courage that was required for all the many successes of this man's life. Every country's leaders need to be called to account for their mindless lockstep with Washington on this planned attack, as well as the sanctions. Who do these leaders work for, their people or Washington/Tel Aviv? At this point, we can only ask the creative power that brought the universe into being (whatever your particular faith or belief system uses for a name) and all that we know as good, pure and beautiful, to put a protective hand on the great people of Iran and spare them and us the planned horror, put every obstacle in the path of the dogs of war, the evil empire, the greedy gluttonous forces of hell that base themselves in the USA and Israel.